The owner/architect for Craftsman Design & Renovation, Wade Freitag, was out of town the last two weeks so while things had been moving along, they've been slowly falling behind schedule primarily because major decisions were not being made. Anyway, Wade returned today and came out for a long appt this afternoon. We managed to whine at him enough about the 6 ugly plastic vents all on the drive-way side of the house that he worked out a way to move a couple of them to other—less visible—sides of the house. Now, we'll just have 4 vents on this one side of the house, instead of 6. Two of them are set pretty high (the range hood and the bathroom fan) but the other two are close to driveway level and easy to see. Unfortunately, we're just going to have to live with this ugly thing from the on-demand water heater. Yuck. Had we known about this unattractive venting, we might well have stuck with the tank water heater. 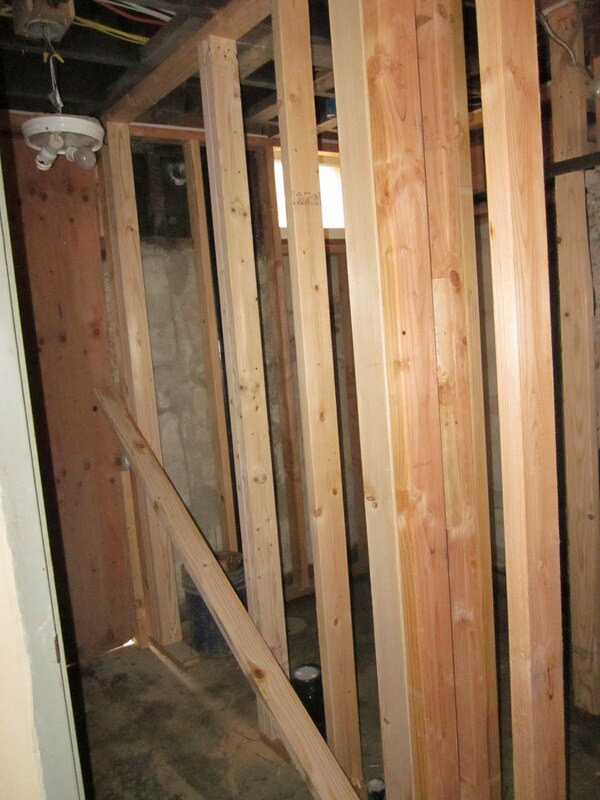 The downstairs bathroom has been framed out. 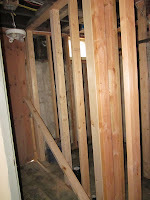 Unfortunately, one of the support beams and the sewer plumbing messed up the original floor plan, so the shower had to be shifted over 6". This shift pretty much eliminates our ability to install the kitchen cabinets on the opposite exterior wall where we had planned. It's a drag, because we saved the kitchen cabinetry so we could reinstall in the basement for a craft area. Now we'll have to change the plan, or abandon it. Today, we finalized the plan for the windows and the exterior siding, so they're now ordering everything. Hopefully the building envelope will get closed up soon.